Some dishes taste better than they look. This is one of them I think. This dish is a typical Middle Eastern breakfast dish – but yet again because we were late back from the boat – 10:30pm this time – I ended up throwing this together in about 25 minutes. It rained all day on Sunday so we decided to take a trip to IKEA to pick up two small sofas to go in the wheelhouse of our boat. Sadly – we did the bad thing which was changing our minds on what we wanted – picked something a little bit bigger and found it didn’t fit ! It was a real shame as it meant we just lost a tonne of time driving all the way back to IKEA to return the oversized items and then had to queue for a refund and buy what we had originally planned to buy. By the time we’d done these two trips (from Maidenhead to Wembley) and assembled, dismantled, reboxed, returned, then assembled the smaller sofas it was very late indeed. We were happy with what we should have bought in the first place though so it really doesn’t matter. Just lost lots of time! 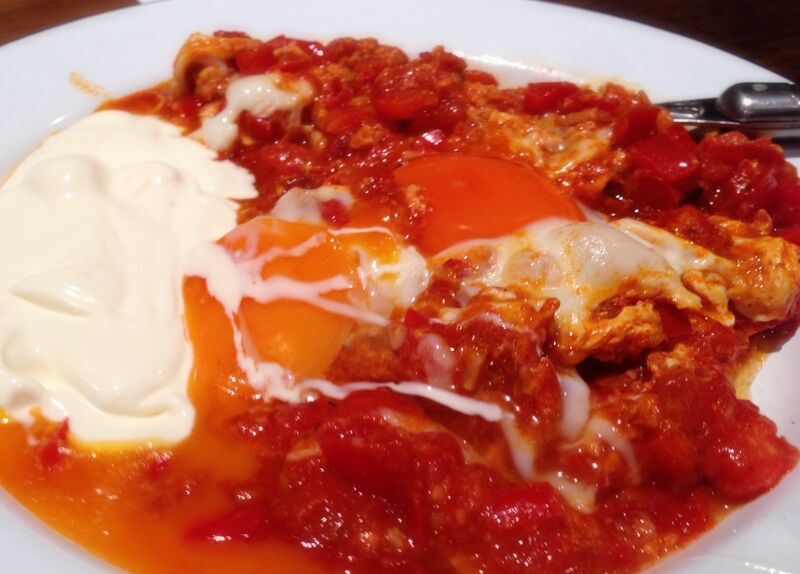 Anyway, this dish is basically poached eggs in a tomato and red pepper sauce. Very simple and very tasty. After dicing a couple of red peppers and chopping a good half kilo of ripe tomatoes, you fry them off with some Harissa (again!) garlic, cumin and tomato puree until you get a nice thick sauce. At this stage you make some wells in your sauce and crack eggs into them – then cook until they are done. While they are cooking you wiggle the whites into the sauce a bit – and that’s it! You serve this dish with Labneh or a thick yoghurt. I used creme fraiche – given I hadn’t made any Labneh (it does take at least a day to make it) and wanted to keep our yoghurt for something else. Basic, fast, and very tasty. A definite dish to have in the bag when you have no time on your hands. We definitely have to get out of the habit of eating so late. It’s not good for us! But better than eating nothing and going to bed on a rumbly tumbly. This entry was posted in 30 minutes or less, Jerusalem, Vegetarian, Want to make again, Yotam Ottolenghi and tagged food, harissa, ottolenghi, recipe, shakshuka by tenuoustoaster. Bookmark the permalink.